Donny Brewer and Jerry Diaz play poolside on Windstar Cruises. While many folks think of a “cruise” being on a huge crowded ships with waterslides and zip-lines there is another option. If you’d rather not be on a ship with 5,000 or so of your not-so-close friends, you can choose the alternative: a Windstar Cruise. This company has much smaller vessels, such as its 330-passenger Wind Surf. The advantages of such a small boat (in comparison to the ‘big box” cruise lines) is the fact you’ll visit islands you may not otherwise get to see, and you’ll also receive more personal attention from the entire staff. By the end of the second day pretty much every crew member knows your name, from the bar, waitstaff, and stewards. Another great advantage to such a small boat is the fact if you bring 90 of your friends like we did, it’s almost as if you’ve chartered the ship for your own private party. Donny Brewer & Jerry Diaz entertain the early arrivals. 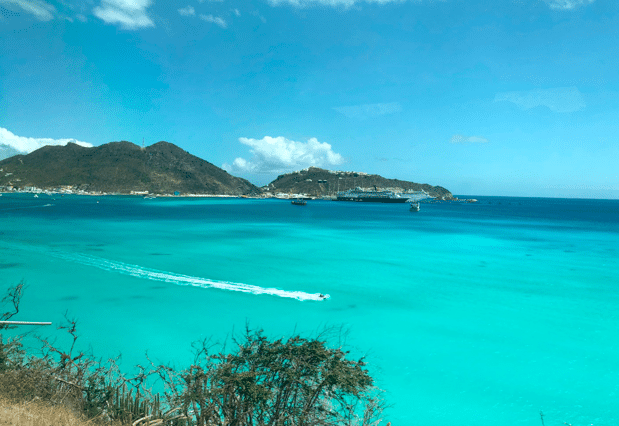 Since the cruise embarks from St. Maarten beginning Saturday morning it’s a good idea to fly in a day early and stay at a hotel on the island. Our group chose the Mercure Marina & Spa on the French side of the island, right on the water. Much of the island, including this hotel, sustained a lot of damage during hurricane Irma September of 2017. For that reason we held our expectations low. The area, including the hotel, have sprung back to life, but it’s still not 100% like it was prior to Irma. The area is open for business and the people are doing a great job but you should still expect the possibility of some power and water outages. As our group began to arrive at the hotel from all over the United States, we began to gather at the hotel pool area. It was a perfect time for us to reunite with friends we know from other events while getting to know new acquaintances. It wasn’t long before Jerry Diaz and Donny Brewer, along with Radio Trop Rock, began setting up equipment for the night’s entertainment. The show almost didn’t happen. During set-up some 110-volt equipment was plugged into the 220-volt outlet without the assistance of an electric converter. A quick cab ride to the electronics store for new speakers and we were back in business. Donny Brewer returns to the hotel pool area after a beer run. The evening was spent with Jerry and Donny playing some great music while discussing some of what everyone should be expected on the week’s cruise. Since the hotel had very limited bar and restaurant options, Michelle Brewer put together a pizza/beer run. Not a bad start for the week: Jerry Diaz, Donny Brewer, pizza, and beer on a tropical island overlooking a pool and the Caribbean. The evening was also the first test for Radio Trop Rock to see if were were able to remote broadcast live in a location where internet was questionable. With a tweak here, and an adjustment there, the broadcast went off without a hitch, bringing the cruise kick-off party to the world via internet radio to anyone wishing to enjoy it. Day 2 was the day to board the ship and start the cruise. Everyone enjoyed a breakfast in the hotel restaurant before boarding the bus and heading over to the cruise terminal. The process was painless and smooth and we were onboard in plenty of time to settle and take survey of the ship. Every cruise starts with the mandatory lifeboat drill. Donny Brewer was lucky enough to get the beer holder option for his life vest. It wasn’t long before everyone was on the pool deck enjoying cold beers and “boat drinks” (fruity beverages filled with rum). We stayed in port just long enough to watch the sunset off the back of the ship. Some caught the view from the pool, some from the hot tubs, and others from the railing. Regardless of your vantage point, it was a perfect sunset. Donny Brewer and Eric Babin (me) enjoying a beverage and sunset in the hot tub aboard the Wind Surf. Having spent years at sea in the Navy I have witnessed literally hundreds of sunsets at sea. This was the first time ever I have experienced the “green flash” sunset. I’d always thought it to be a mystical “unicorn” thing but now I know it does exist. As the boat got underway I soon realized why the swimming pool was only two thirds full with water. Since the boat was pretty small it did rock back and forth a little more than the larger cruise ships. This turned the swimming pool almost into a wave pool. As the pool party wound down the group returned to their state rooms to clean up before heading up to the dining room for a fantastic first meal aboard the Wind Surf. The view from Shirley Heights Antigua. Our first port visit was in Antigua. 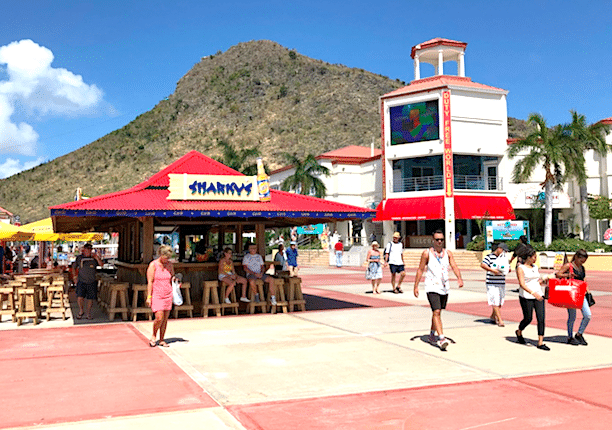 Since Donny & Jerry’s show at Life On The Corner Bar and Grille was not set to start until mid-afternoon, much of the group took advantage of this time to explore the island. Some went on organized excursions such as diving, snorkeling or sailing, others simply grabbed a cab and hired the driver as their own personal tour guide. Donny Brewer & Jerry Diaz perform for a standing room only crowd at Life On the Corner, English Harbor Antigua. After the tours then it was time for a Jerry Diaz / Donny Brewer show at Life On The Corner Bar and Grille. The owner was very receptive and helpful as we prepared the stage for the show. Also, the bar was at a very convenient location, as it was just steps away from the drop-off location for the cruise ship’s tender. Jerry Diaz & Donny Brewer even entertain us while we are waiting on the tender to return to the ship. We are transported back and forth to shore in a “tender” which is really just a lifeboat. This is done when there is no place for us to moor pier side and we must anchor in the harbor. By the time the show started at 3 p.m., it was standing room only. Although the majority of the crowd was our group, there was a large group of locals that stopped by to enjoy the show. In fact, it wasn’t long before the locals walking by began dancing in the street. Donny brewer did not miss this chance to take his wireless guitar to join the dancers in the street leading a conga line of tourists and locals alike. A “day at sea” certainly does not mean a day with nothing to do. The casino is one option, while there are plenty of other games going on around the ship. Jerry and Donny took it upon themselves to have an unscheduled concert by the pool. Bert Hebert and Bob Durand also did a set. Although our group made up a little more than 1/3 of the passengers onboard, those that were not part of our group also enjoyed the show. It was a great show for everyone with the best seats in the house being in the pool, hot tubs – or bar. View of ships at the pier in Tortola. The day started with a quick stop for shopping in Tortola. Some chose to stay close to the ship’s pier to do shopping while others rushed across to the other side of the island to take in Cane Garden Bay. After everyone returned from their excursions the ship left for Norman Island. 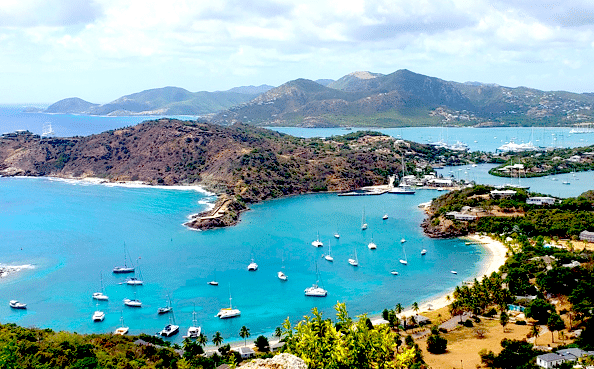 Norman Island is a perfect example of what you will NOT see if you are on a larger cruise line. Looking at Norman Island you’ll see one beach, two bars. Our group set up shop at Pirate’s Bight Bar. Just a few steps across the beach and you are at an open air seating area with just enough shade for our group to witness another great afternoon of live music by Jerry Diaz, Donny Brewer, Bert Hebert and Bob Durand. This location was great because you could enjoy the show from the location of your choice; the bar, the beach or the pier. Another day, another conga line, this time on the beach. Due to the small size of this beach it is a very popular spot for catamaran charters to spend the day and evening. This gave us a chance to meet some new folks that were not on our cruise. Norman Island – Eric Babin (me), Jerry Diaz and Donny Brewer plan the trip ashore. Pirate’s Bight bar Norman Island, British Virgin Islands. Pirate’s Bight Norman Island – Donny and Jerry performing sound check before their show. Pirate’s Bight Norman Island – Radio Trop Rock set up and broadcasting. On stage Bob Durand and Bert Hebert. Sunset view from Pirate’s Bight. The show was just ending as we witnessed another spectacular Caribbean sunset. Surprisingly enough this near-deserted island’s internet was just quick enough for Radio Trop Rock to share the show with the world live on air. One word of caution regarding Pirate’s Bight. They do accept credit cards but I recommend using cash. They take U.S. Dollars. A few of our group that used credit cards found out when closing out their bill, the drink prices charged were not as verbally advertised. One example includes a couple being quoted $3 per drink but were charged $14 per drink on their card. View of White Bay Jost Van Dyke on the drive from the ship. No trip to Jost Van Dyke could be possible without a visit to one of the most famous beach bars in the world, The Soggy Dollar Bar located on White Bay. Getting its name from the fact many patrons swim ashore from their boats, thus, paying with “soggy dollars,” this bar is most famous for its drink called the Pain Killer. This drink includes pineapple juice, orange juice, cream of coconut, and of course rum. Then it’s sprinkled with ground nutmeg. Although the Painkiller is “THE” drink to get at Soggy Dollar, one of our group suggested Donny and I try a “Soggy Man.” As I watched the bartender make the drink I thought to myself “nice, 3 types of rum,” then the bartender grabs another handful of bottles “ok, 6 rums”, and then, I couldn’t believe it, another rum. Seven different types of rum filled the cup! White Bay Jost Van Dyke – Just another “day at the office” for Radio Trop Rock. Soggy Dollar Bar Jost Van Dyke – Donny Brewer & Jerry Diaz. Donny Brewer and Eric Babin (me) toasting another job well done. Having seen this I was ready to grimace with the first sip….. strangely enough, it was very tasty and surprisingly smooth. There is no doubt this could be a drink that leads to bad decisions if you are brave enough to drink more than one. The Soggy Dollar Bar also serves some great food for your beach appetite. A friend of mine shared their conch fritters with me which was the perfect complement to my cold beer on the beach. There is much more to the Soggy Dollar Bar then just drinks and food. Without a doubt, White Beach, where the Soggy Dollar is located, has the most beautiful views anywhere in the Caribbean. The most amateur of all photographers can’t help but take a postcard quality picture from any angle. The real-time view looks as if it’s an advertisement for travel that has been doctored with colorful filters and Photoshopped. This is the famous Soggy Dollar Bar. Another item I must mention is the staff at the Soggy Dollar Bar is top notch friendly and professional. You’d think with a location like that they’d not try hard to make you feel comfortable, knowing you’ll visit regardless, but they go out of their way with smiles, help, and fast service. If you ever have the chance to travel to this area of the world, make this beach #1 on your list. Here is a tip: If you know you have friends that will be at the Soggy Dollar Bar, you can go online and buy them a drink in advance. Just be sure to tell your friends to check the list when they arrive. After a quick trip back to the ship to clean up and have dinner we headed back ashore for a stop at Foxy’s. The bar was not busy at all. Just a dozen or so folks singing along to karaoke that was being brought up via YouTube. It was quite the experience as every now and then the feed would buffer due to slow connection. That didn’t stop the singers though, as they continued on, requesting help from those watching them. No stop to Foxy’s would be complete without what it is famous for, Firewater Rum. Kenny Chesney sings about Firewater rum in his song “Somewhere in the Sun.” I can tell you it isn’t the best tasting thing I’ve ever had, but, it certainly did the trick to get kick-started for a great time at the bar with friends including Trina Geer from Oklahoma, who was celebrating her birthday. People have paddle boards and beach time on Virgin Gorda, Virgin Islands. This day was one in which was a little different than the rest of them. Once ashore you were free to take a tour as you desired, but you did not want to miss the “beach party,” hosted by Wind Star Cruises. We were shuttled to a private beach where Windstar staff was eagerly awaiting to help us have a great beach day. There were complimentary water sport equipment, including sailboats, paddle boards, and snorkel equipment. There was also a huge floating trampoline and sunning pad for us to enjoy. The staff walked among the beach chairs bringing beers and other beverages to the thirsty beach goers. They would even wade into the water to serve drinks to those that chose to simply float in the clear blue waters. The staff was also serving up grilled burgers, hot dogs and bratwurst to order. Any day on the beach is great, but when you’ve got a great staff there to keep your thirst and hunger at bay, it’s even better. Le Select – St. Barthelemy – Donny Brewer table hopping for dramatic affect. St. Barthelemy may have been the busiest island we visited. Where we landed in Gustavia, the scene was rocking with boats, big and small, making their way in and out of the harbor. Our group headed over to Le Select. This is a musically historical location. As the story goes, Jimmy Buffett was at Le Select having a cold beer one day. They owner approached Jimmy and asked if he could use the name “Cheeseburger in Paradise” for his burger stand. Jimmy agreed on one condition. If Jimmy was allowed to eat and drink free for the rest of his life, the owner could use the name. A quick handshake and the deal was sealed. Cheeseburger in Paradise is one of Jimmy’s most popular songs among Parrotheads (Jimmy Buffett fans). This is another location where the staff was very helpful. Le Select – St. Barthelemy – Folks lining up at the bar for cold beer as Donny Brewer & Jerry Diaz brave the heat performing some great music. Le Select St. Barthelemy – overflow crowd for the show. We helped ourselves to moving the tables around to accommodate the show Jerry and Donny were ready to provide. It was a very hot day on St. Barths with temperatures reaching the high 80’s, and even a little warmer no doubt on the stage, which 1/2 of was in direct sun. The drink of the day was Landshark Beer and lunch was cheeseburgers – to no one’s surprise. While our group filled up Le Select others began to fill the surrounding open air bars also enjoying the music. You could see those in the other bars shooting videos of us in Le Select. Departing from the international airport in St. Maarten. Departing the Wind Star Wind Surf was easy and smooth. Another advantage to being on the smaller boats is you are not working your way through another 5,000 passengers to make it ashore. I must share this advice with you regarding the airport in St. Maarten. If your airline ticket says “arrive two hours prior to boarding” do not for a moment consider showing up early. The original airport was damaged during hurricane Irma and is yet to be rebuilt. The current airport is very small with virtually no seating in the lobby area. They won’t check anyone in and allow them to pass through screening until two hours prior to boarding, so you are stuck standing or sitting on your luggage until you are within that time-frame. If you have an afternoon flight, stay in town or take a tour. The only thing better than going on cruise is going on a cruise with 90 of your closest and most fun friends. The only thing better than going on a cruise with your friends is going on a cruise with your friends onboard a small ship and bringing your own live music entertainment. The cruise consisted of just the right mixture of time to spend exploring as you wish and time spent on planned group activities. The fact we had Jerry Diaz and Donny Brewer not just playing music for us almost every day but also hanging out with each person sharing a meal or beverage while discussing the activities of the day made this one trip to remember. It is this type of entertainment and interaction that sets these cruises apart from the others. Jerry Diaz and his wife Mary have been doing this for years as Sail Away Entertainment and their experience shows in the quality experience you receive when trusting them with your fun. Having them at the helm with help from Martha Green of Sunset Travel made this a near perfect week. Check another great adventure off my bucket list! All photos courtesy of Radio Trop Rock unless otherwise noted.